I keep buying hummus at the store (when I can find one without vinegar) because it seems like it should be the answer to making it easier to eat more veggies at snack time. A candida diet friendly snack that is relatively low-carb and low-fat. Problem is that usually after one serving I lose interest, as does the rest of the family, and I end up throwing it out when I find it at the back of the fridge two weeks later. I finally need to admit to myself. I DO NOT LIKE STORE BOUGHT HUMMUS. Just give up. The idea of it is there - healthy, convenient, veggie friendly - but it just isn't something appealing to me. Not quite ready to give up on it I thought I would experiment a bit in making my own. I didn't add any Tahini because I didn't have any (that wasn't way past its best before) but you could if you so choose. It didn't need it. I doctored my version up to make it PIZZA inspired. Because everyone in my house loves pizza. Check out my Insanely Good Spaghetti Squash Pizza if you want an actual pizza that is insanely good and completely grain free. Everyone actually liked this hummus. I won't be throwing any of this away. I'm so excited! [Update: I went to make my lunch for work thinking I would take some hummus and it had dissappeared - all gone - I was kind of annoyed but kind of happy]. It was super simple to make. It would be even simpler if my food processor was working. But I was still able to make it in my blender with a bit of "on-off-scrape down the sides" action. I served this to the kids on gluten-free crackers with some chopped up gluten-free/nitrate-free pepperoni sticks. I think they would also love it on rice cakes. I will be sending it for lunch for my Grade one'r. And I ate mine with veggies of course. 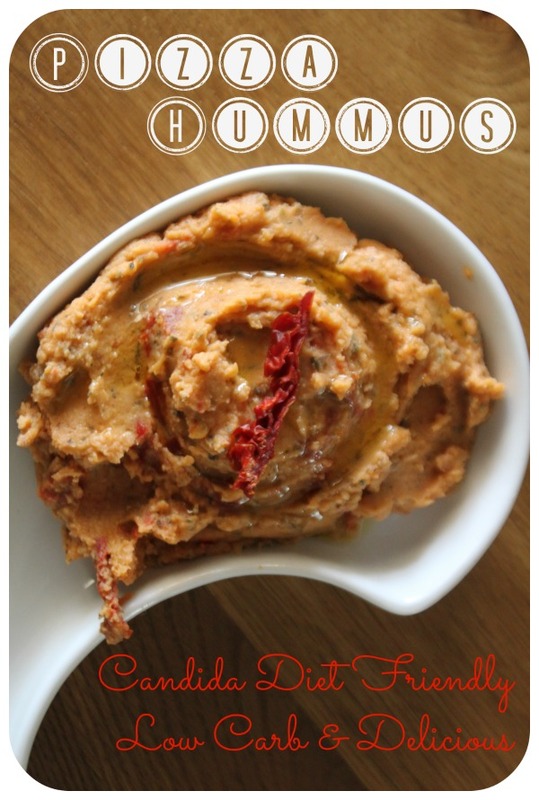 If you are like me and love the idea of hummus but not the taste then give this a try. You might find you LOVE it. I just threw everything in my blender (Ninja) and pulsed for about 5 minutes. I had to stop it several times and use a spatula to clean off'/push down the sides. If you have a food processor that would work even better. Once blended I would chill before serving. You can top with some drizzled extra virgin olive oil. If you aren't dairy free this would also be good with some Parmesan cheese.